Aryeh Frankfurter and Lisa Lynne : Weaving Worlds. The finest in acoustic, instrumental, world music. Celtic Harp, Swedish Nyckelharpa, World Flutes, Ukranian Bandora and more, artfully performed by Internationally renowned recording artists Aryeh Frankfurter, Lisa Lynne and George Tortorelli. This deep and gentle music will uplift and nourish the soul. 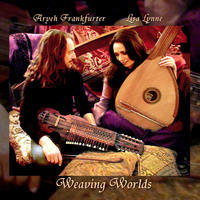 License Two worlds, one music by Aryeh Frankfurter and Lisa Lynne for your project. Play the music of Aryeh Frankfurter and Lisa Lynne in your restaurant or store.